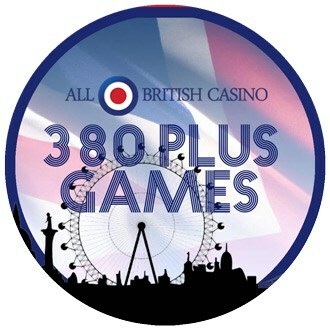 All British Casino - Multiple Extra Spins is up for grabs! Join now! All British Casino combines the British feel with a fun but safe gaming environment and is regulated by the UK Gambling Commission and licensed by the Malta Gaming Authority. The casino’s theme is all about being British and you will be greeted with pictures of famous London landmarks, such as The London Bridge and Big Ben. A truly proud to be British casino specifically for the UK public, as it uses the local currency of Great British Pounds (GBP), but also welcomes players from overseas to enjoy the delights of an authentic British online casino feel and experience. With over 400 games provided by three of the top gaming providers, Netent Microgaming and the newly added Amatic games, you will be spoilt for choice! Depositing and withdrawing money is straightforward and easy with their no-nonsense banking. Topped off with the delightfully friendly native British support staff who are at your beck and call twenty-four hours a day, seven days a week to give you the best All British experience. All British Casino has an amazing welcome package, where on your first deposit you can claim a bonus and furthermore you can unlock extra spins! Only available to UK players. On top of this fantastic welcome package, there are plenty of other opportunities to get bonuses from the weekly and monthly ongoing promotions. Such as the chance to get more for your money with their reload bonuses. Not just for the Brits, who do love a good freebie, but for all players. You will also be entered into the loyalty program by collecting player points; whereby you accumulate points for every £10 deposited and this in turn can be converted into a bonus! All British Casino run regular weekly promotions to unlock extra spins such, as “Surprise Spins Sunday”, whereby you receive a surprise amount of extra spins on a particular game as a thank you for depositing within the last week and these are automatically loaded to your account, waiting for you. All British also celebrate the launch of big new game releases with extra spin promotions plus extra spins on login for the most loyal customers. 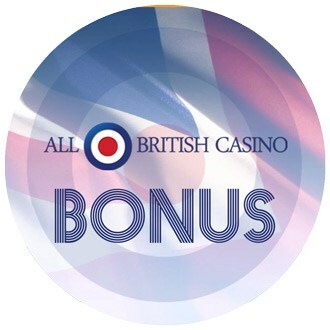 Any winnings from All British Casino extra spins is granted as a bonus and needs to be wagered thirty-five times before any winnings can be withdrawn. All British Casino deals with the local currency Great British Pounds (GBP), but don’t worry if you are from overseas you can convert your chosen currency into GBP. There are seven different deposit options from credit cards to e-wallets such as Neteller and Skrill and even using your mobile; Boku – All British think of everything to make depositing not only simple and easy, but free of charge. Withdrawals are still free of charge and just as easy and simple and processed within 24 working hours of submission. All British Casino now offer over 400 games since adding Amatic Games to the equation, joining another two top online casino games platform providers; NetEnt and Microgaming. All the games are categorised into various types, making games easy to locate. Play one of the many slot games with various themes. Get yourself into holiday mode with holiday themed slots, such as Spring Break, Beach, Bikini Party. For the sporty guys and gals out there you can try Basketball Star, Cricket Star and Football star or for the movie buffs, slots such as Game of Thrones, Hellboy and Terminator. Slot games not your type of thing? Then check out the LIVE casino where you can experience the live feel from the comfort of your own home and interact with the dealers. Whether you prefer classic slots, video slots, card games or other casino games you will definitely find something you love and will want to keep coming back. Always on the move? Don’t want to be stuck to your computer? All British Casino ensures you can still enjoy their games by accessing their website through your mobile browser on any smart device or tablet and there is no need to download a dedicated app. With 145 mobile casino games available you will not be disappointed. Don’t be left out of the chance of hitting it big and winning one of the three jackpot games whilst on the move, including their most popular one: Mega Fortune Touch. You will have no communication barriers with All British Casino’s friendly, native British support staff. They will provide you with true British hospitality and are available 24/7 and can be contacted by telephone, email or live chat. You can also find a comprehensive list of frequently asked questions at the bottom of the page to get solutions for different issues very quickly. You don’t need to join the queue to join the casino! Enjoy the British casino experience from your own home and why not join in with the Britishness by having tea and scones whilst playing the games? This casino appeals to all types of players and there is a wide range of benefits that include bonuses, games, localised customer support and fun branding. All British Casino takes pride in offering not only a fun but also a safe product and platform for entertainment where you are also feeling completely secured when depositing and withdrawing money. Become a VIP and get treated like royalty with a bespoke package tailored to your individual needs, such as special bonus terms and cashback deals! Whether you are from the UK or abroad, you will not want to miss out on joining the All British Casino honour roll. Tootle pip!